The Vietnam News Agency (VNA)’s staff have donated 310 million VND (13,950 USD) for flood victims in the central region. 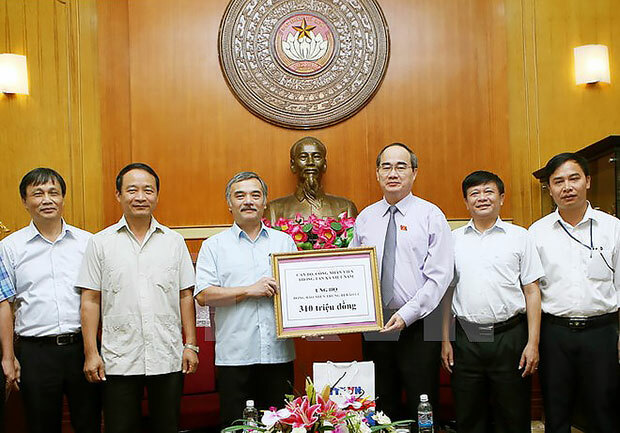 Vietnam Fatherland Front (VFF) Central Committee President Nguyen Thien Nhan received the VNA’s money as well as donations worth 100 million VND from the NA Committee for Ethnic Affairs in Hanoi on October 21. The VFF launched a campaign to support flood victims in the central region on October 17, with 2.7 billion VND (121,500 USD) collected so far. Of the sum, 2.6 billion VND (117,000 USD) has been transferred to five central provinces. On the same day, the North Power Corporation under the Electricity of Vietnam (EVNNPC) announced that it has mobilised donations worth nearly 2.2 billion VND (99,000 USD) from its staff./.